In 1983, I heard for the very first time the word “Immunodeficiency”. I was 15 and this was how my little sister’s, Maria Charalambous, condition was called. She was diagnosed when she was 11 and it took us as many years as her age to find out. 36 years on and I still meet families who ask me what immunodeficiency is and where they can seek help for their child in Cyprus. Every time I get this question, painful memories wake up frustration, despair, anger and anguish. The pain every parent fears the most – not to be able to do something for their child, feeling helpless and useless despite of how rich, poor or how well educated you are. Living in a small island such as Cyprus and with the local medical community knowing close to nothing about primary immunodeficiencies (PIDs) it is always difficult to get an early diagnosis for PID. Even in developed countries diagnosis of PIDs can be tricky and painfully slow. The main problem, common to all parts of the world, is that we do not know enough about PIDs and, most importantly, the awareness among the public and the medical community is low to say the least. Visits to numerous paediatricians and doctors, test after test, hitting walls and having more questions than answers until someone stumbles on PID. After 11 years and numerous visits to other countries, paid out of the family’s pocket, Maria was finally officially diagnosed, in the Uk. 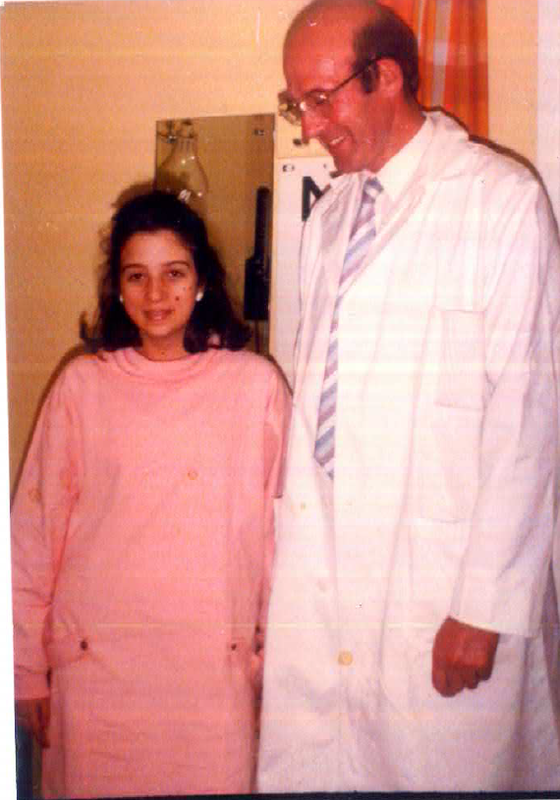 Maria Charalambous and Dr Webster in London in 1985. Dr Webster diagnosed her and was her doctor until his retirement. Even if you are fortunate enough to be diagnosed early, there is another obstacle: is there an immunologist near the area you leave? In Cyprus, we do not have one. The local doctors who monitor PID patients are pathologists, hematologists, infectious diseases’ specialists and rheumatologists. Decisions regarding appropriate treatment, dosage, not to mention the bureaucracy around the process, make things very complicated for patients and families. Sometimes it’s like going in circles, repeating yourself time and time again hoping to persuade a government official, who knows nothing about PIDs, to get a grant to cover some of the expenses. PID diagnosis and treatment is expensive even for an average income family in Cyprus. In the last 35 years, we have taken steps forward to provide a better quality of life to the PID patients in Cyprus but there is a long road ahead and, most importantly, a lot has yet to be done to bring awareness to the public and the medical community. We have neither an immunology doctor nor an immunology nurse in the island, no day care center and we sometimes struggle to get enough supply of immunoglobulins for all the patients that need them. In 2019, we have arranged a number of activities to bring awareness to the public through the media, radio, TV, social events along with other Rare Diseases’ organizations and, most importantly, for the 1st time, members of the Cyprus Primary Immunodeficiencies and Friends Association will be present at the annual Congress of the Cyprus Paediatrician Association and a presentation will be made from a visiting Immunologist. We consider Paediatricians the 1st line of defense against PID. In February, leaflets and information material will be given to all public schools in Cyprus in an effort to expose the young generation to what is a Rare Disease and PID. Maria and Dr Webster in 2016 in London, during World Primary Immunodeficiencies Week (London).